Each time you use your sound level meter, it should be calibrated using an acoustic calibrator. This can help you ensure that your instrument is measuring correctly and that you are complying with the requirements of any standards, regulations or guidelines that you are working to. Most noise standards, regulations and guidelines require that your sound level meter is calibrated before it is used. If you don’t follow these requirements, any measurements that you make could be questioned and called into doubt. Also, if you don’t calibrate your sound level meter, can you be certain that it has not been damaged or malfunctioned in some way? 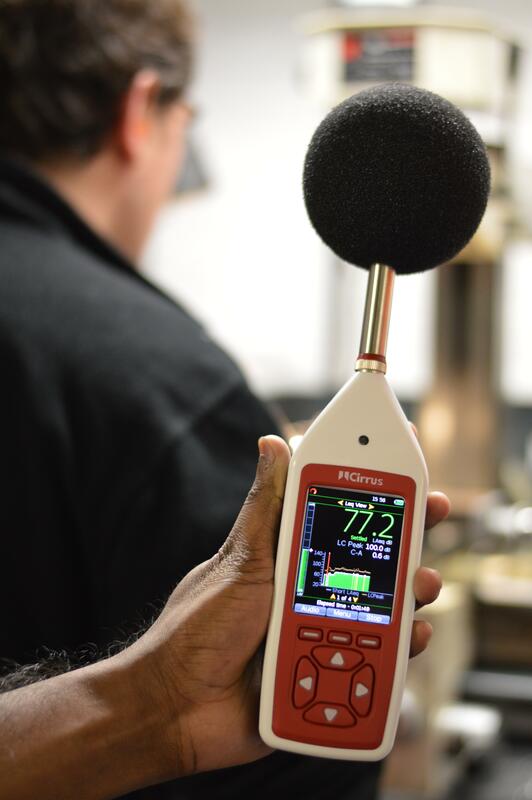 Calibration is therefore vital and you should always use a sound level meter with an appropriate acoustic calibrator. Your acoustic calibrator will provide a fixed level and frequency that the instrument can be referenced against. For example, a Cirrus CR:514 Class 2 calibrator produces a reference level of 94dB at a frequency of 1kHz. The calibrator should be attached to the sound level meter following any instructions from the manufacturer. The reference level provided by the calibrator is used by the sound level meter to verify that it is measuring within a set of tolerances. If the instrument sees that the level is outside of these tolerances it will usually indicate an error or fail to calibrate. Most modern sound level meters will calibrate themselves automatically, either when a button is pressed or when a menu is selected. The instrument will then check that the level being measured is within the tolerances allowed. There may be a small correction that has to be applied at this point and most modern sound level meters will do this automatically. For example, the correction required for a Cirrus optimus sound level meter when it is used with a Cirrus CR:514 calibrator is -0.3dB. This is known as a free field to pressure correction and is a specified for the combination of the microphone capsule and acoustic calibrator being used. When the optimus sound level meter is told to calibrate, it is looking for a level of 94dB – 0.3dB and so will calibrate itself to 93.7dB. This correction value is unique to the combination of calibrator and microphone capsule being used and so you should only use combinations of calibrators and microphones for which you know the exact figure needed. Calibration of your sound level meter is important for a number of reasons. Firstly, it allows you to see that the sound level meter is giving you the correct level against the reference provided by the calibrator. If your sound level meter does not calibrate correctly, you can take further action such as having the instrument repaired or inspected before you make any measurements. Secondly, most standards, regulations and guidelines require that your sound level meter is calibrated before it is used. If you don’t follow these requirements, any measurements that you make could be questioned and called into doubt. If you are looking for a sound level meter with an acoustic calibrator, we would recommend that you look at a complete Sound Level Meter Measurement Kit. This will contain the sound level meter, the appropriate acoustic calibrator, a windshield, a secure carrying case, manuals, batteries and all of the other parts needed to carry out a noise measurement. Have a look at our Sound Level Meters to see which would best meet your needs and then Contact Us to get a quote tailored to your application and requirements.